A Fine Time is indeed a very fine CD compilation. The first full look at a small southern soul label Minaret Records from Florida, which was full of southern soul. From the late sixties we have a range of deep soul to the funky 1970's. The stomping Them Changes by John Hamilton & Doris Allen. Not a dud track in sight and a pity they did not include the A side of Willie Cobbs Don't Worry About Me, the very collectable I' II Love You Only. 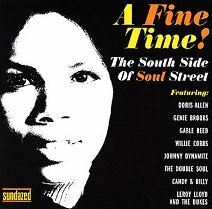 You may be wondering why Candi Staton is on the cover? well she's the other half of Candy & Billy, and Billy who sounds very much like Joe Tex on The Judgment. Issued on Sundazed SC 11153 USA.